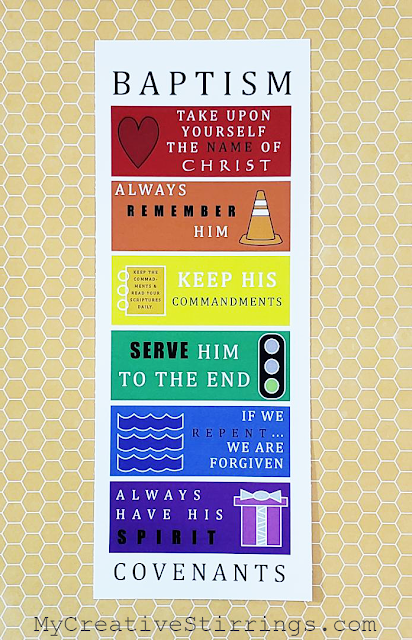 This gift correlates with The Church of Jesus Christ of Latter-day Saints, Come Follow Me Lessons for both Families and Individuals as well as Primary. This is a great gift to share with primary families, ministering families, your family, friends, neighbors, and strangers. 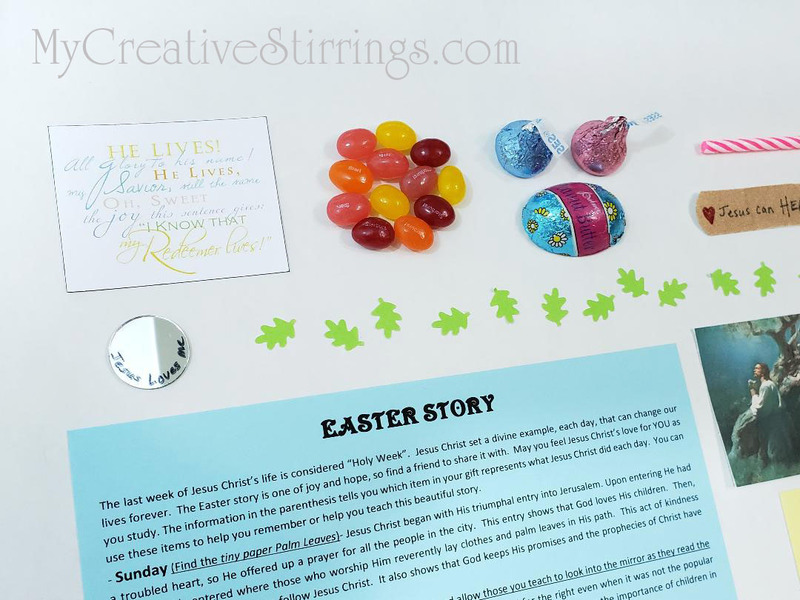 It is an overview of the Easter story with props, that allows people to stay engaged as they share this beautiful Easter message of hope and joy. 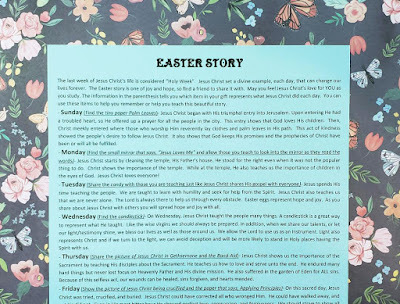 My church is making this for each Primary child for Easter, to help them teach their loved ones about Jesus Christ. 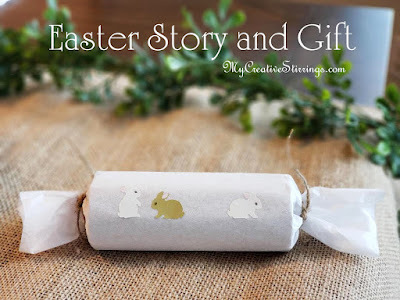 I used a toilet paper tube, 1/4 sheet of white tissue paper, 8 inches of twine, and Mrs. Grossman bunny stickers to wrap and decorate each gift. 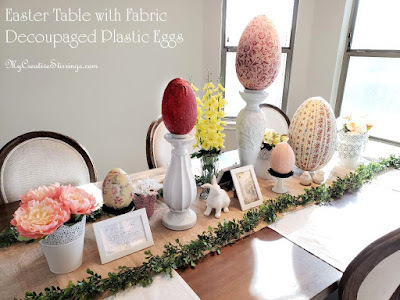 You could also use a large Easter egg, paper bag, plastic bag, or box. If you use a tube you may want to place the non-paper objects in a plastic bag inside the tube so they don't get lost when unwrapped. The contents in this Easter Gift. 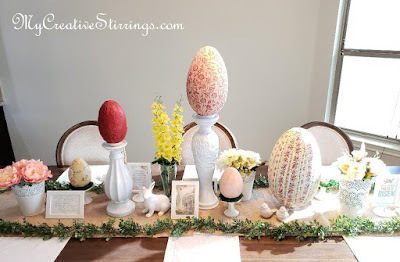 This Easter story can be copied and pasted from this blog post. 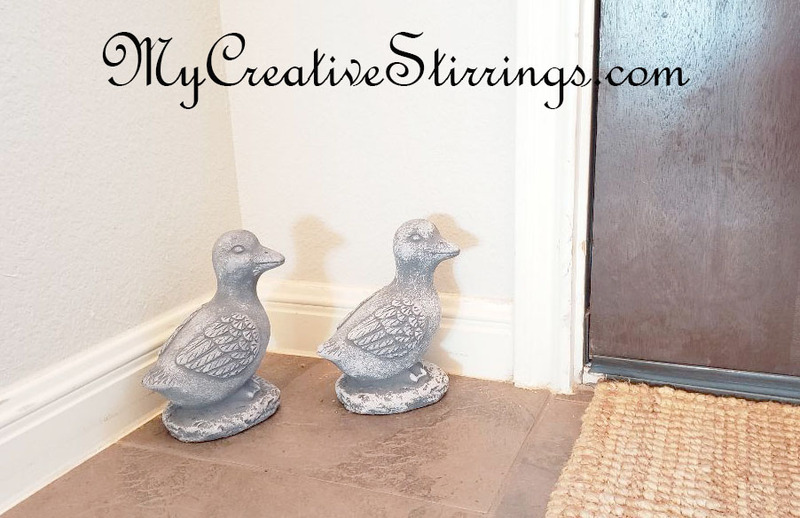 You can find all verbiage for this gift at the end of this post. Email me if you want a PDF. I happened to own a few paper leaf punches :). I am aware that this is not exactly a palm leaf, but it is similar :). If you do not have a leaf punch you could print off a palm leaf image or cut one out of cardstock. 1-inch Mirrors on Amazon. I spent $7.25 for 50 1-inch mirrors. 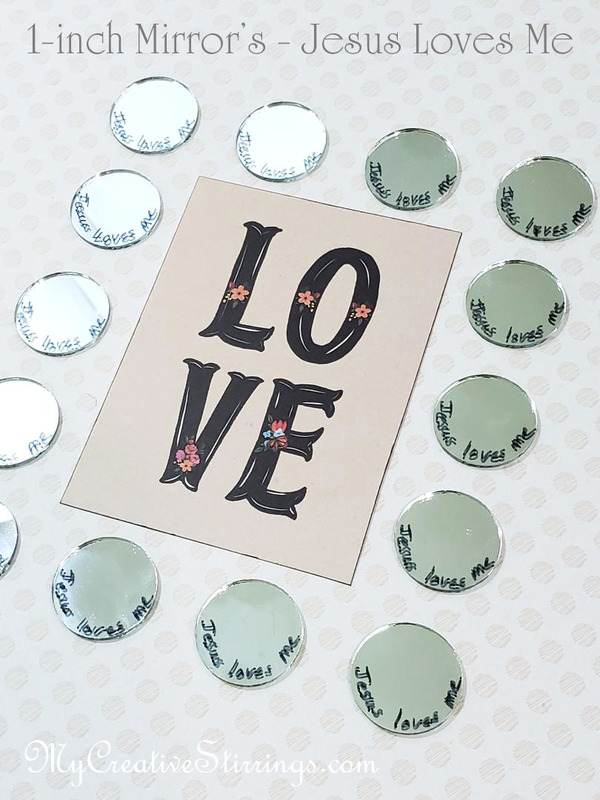 I used a permanent marker to write "Jesus Loves Me" on each mirror. It only takes a few minutes! 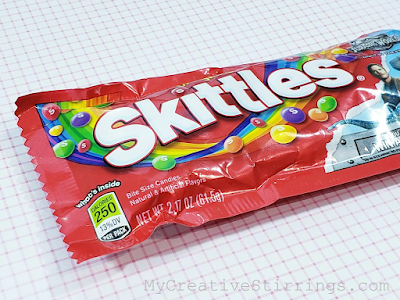 You will be surprised how much candy you can fit in a toilet paper tube ha ha. Jelly beans work well with the Easter story. 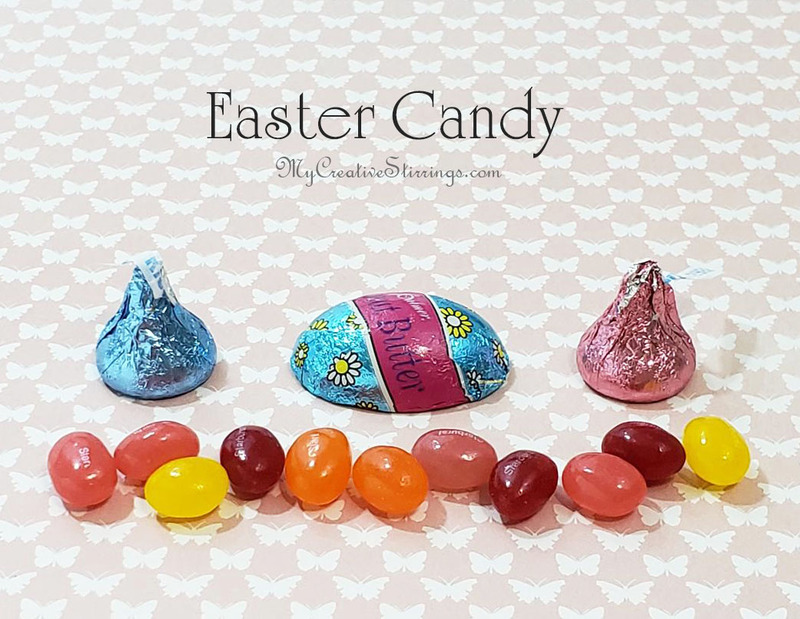 Chocolate kisses, or kisses from Heaven, are always appropriate too. 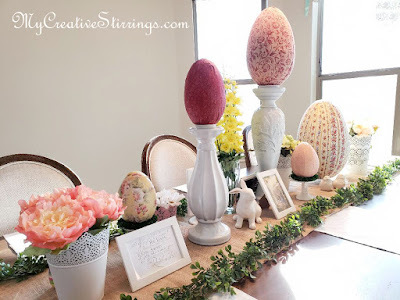 These pictures were found on Lds.org in their free media library. This is an amazing site where you can find 100's of free digital pictures and quotes! I am not getting paid to say this...it really is fantastic! Yes, this is a Band-aid. 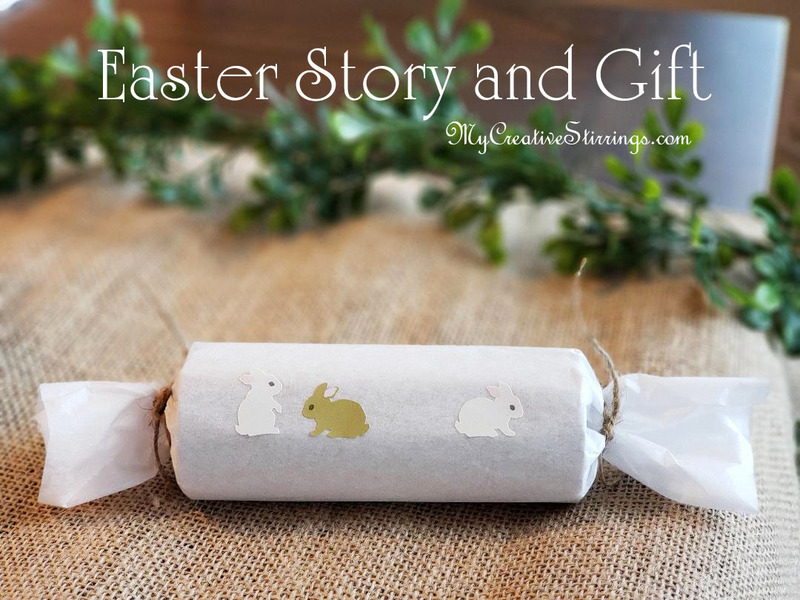 I will most likely not unwrap it when I give it in this gift but will write these words on a separate slip of paper or directly on the package. If you know me, you also know that I am all about Applying Principles in life. Let's put what we learn into action! 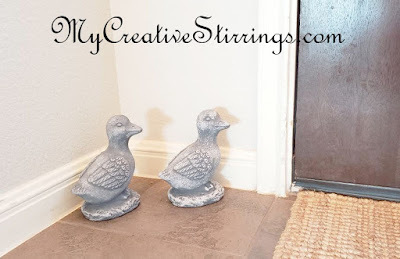 This list of ideas is found at the end of this blog post. 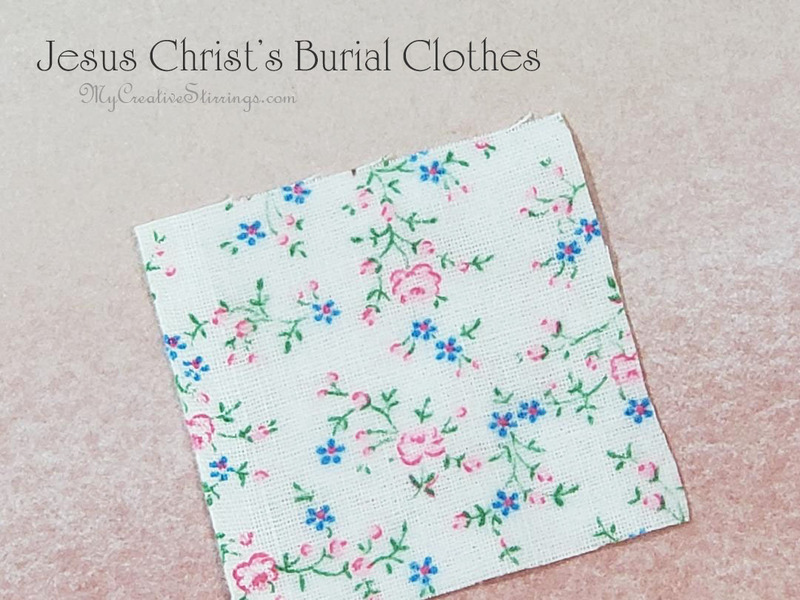 I cut a small square of flannel to represent Jesus Christ's burial clothes. Any fabric swatch will work. This quote is found on Quotes Gram. 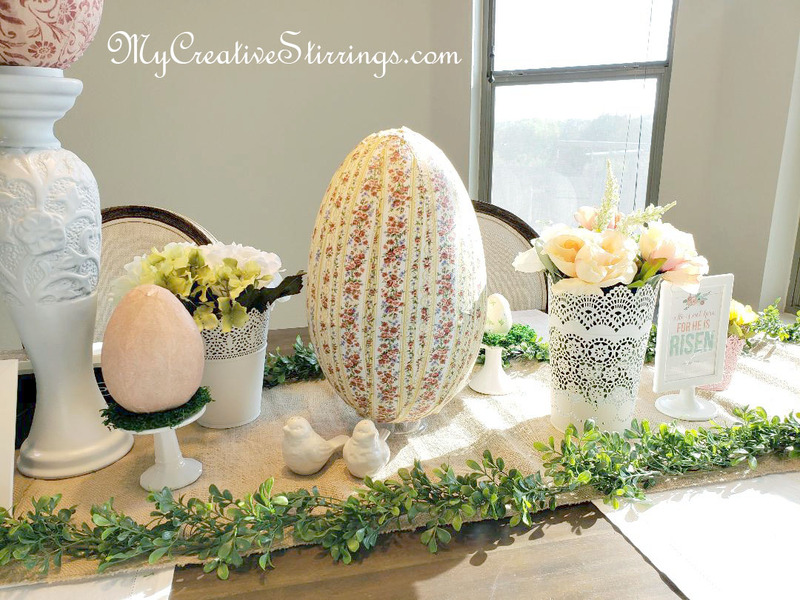 There are many religious Easter quotes that would be perfect for this gift. Check out Lds.org's free media library for more. 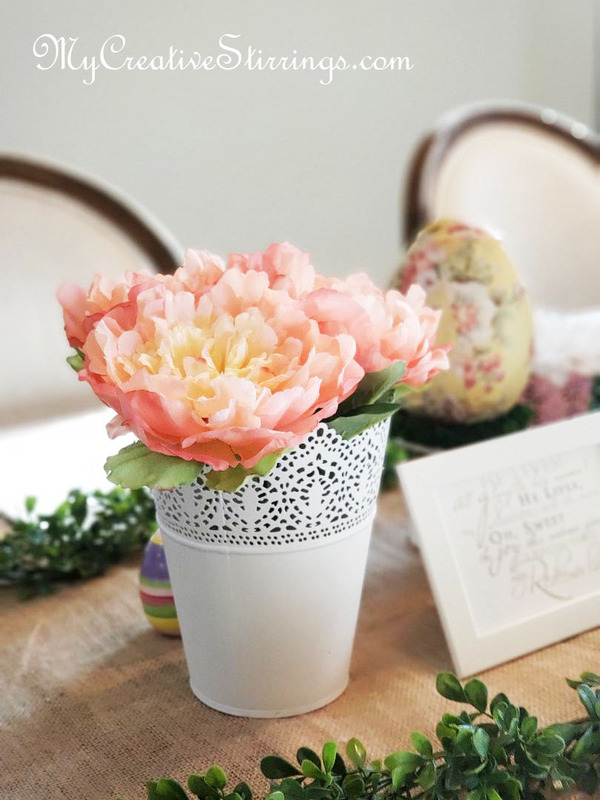 The last week of Jesus Christ’s life is considered “Holy Week.” Jesus Christ set a divine example, each day, that can change our lives forever. 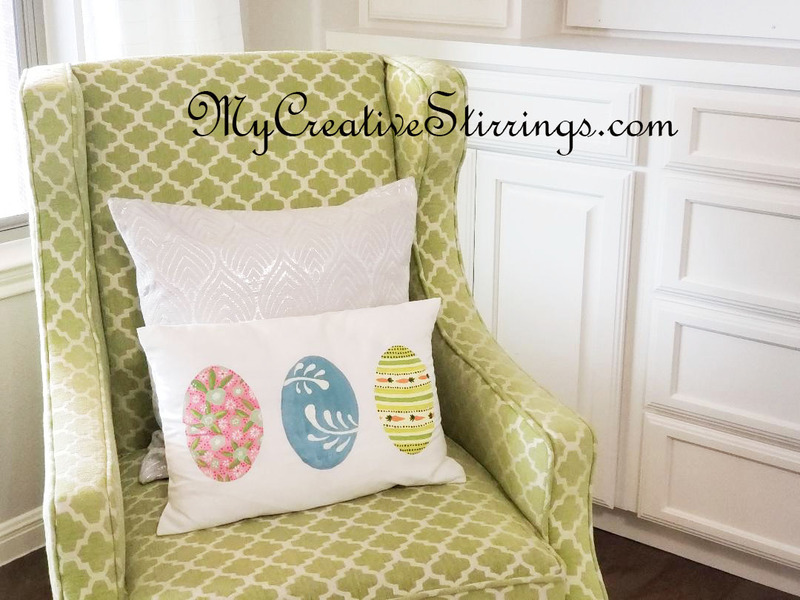 The Easter story is one of joy and hope, so find a friend to share it with. May you feel Jesus Christ’s love for YOU as you study. 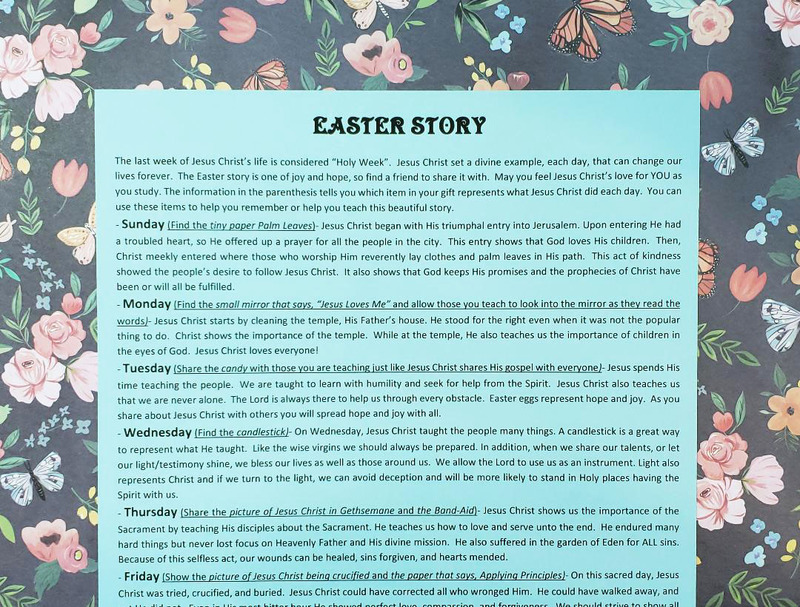 The information in the parenthesis tells you which item in your gift represents what Jesus Christ did each day. You can use these items to help you remember or help you teach this beautiful story. 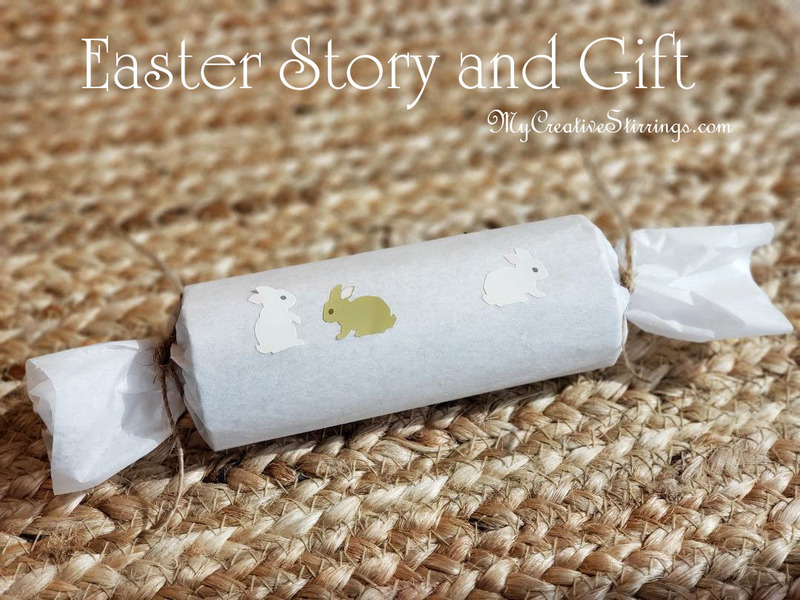 - Sunday (Find the tiny paper Palm Leaves)- Jesus Christ began with His triumphal entry into Jerusalem. Upon entering He had a troubled heart, so He offered up a prayer for all the people in the city. This entry shows that God loves His children. Then, Christ meekly entered, and those who worshiped Him reverently lay clothes and palm leaves in His path. This act of kindness showed the people’s desire to follow Jesus Christ. It also shows that God keeps His promises and the prophecies of Christ have been or will all be fulfilled. - Monday (Find the small mirror that says, “Jesus Loves Me” and allow those you teach to look into the mirror as they read the words)- Jesus Christ cleansed the temple, His Father’s house. He stood for the right even when it was not the popular thing to do. Christ shows the importance of the temple. While at the temple, He also teaches us the importance of children in the eyes of God. Jesus Christ loves everyone! 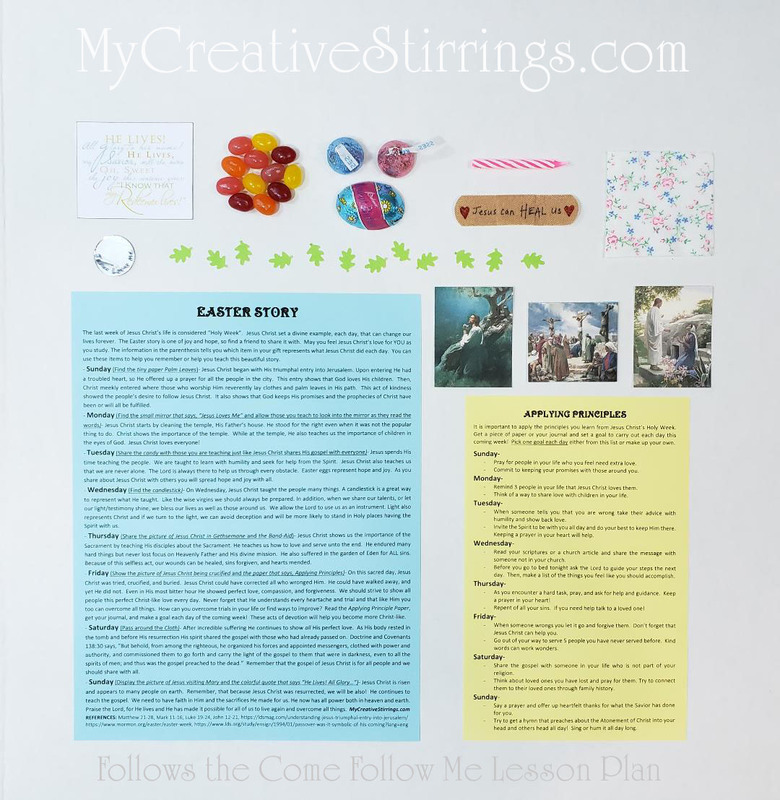 - Tuesday (Share the candy with those you are teaching just like Jesus Christ shares His gospel with everyone)- Jesus spends His time teaching the people. We learn with humility and seek for help from the Spirit. Jesus Christ also teaches us that we are never alone. The Lord is always there to help us through every obstacle. Easter eggs represent hope and joy. As you share about Jesus Christ with others you will spread hope and joy with all. - Wednesday (Find the candlestick)- On Wednesday, Jesus Christ taught the people many things. A candlestick is a great way to represent what He taught. Like the wise virgins we should always be prepared. In addition, when we share our talents or let our light/testimony shine, we bless our lives as well as those around us. We allow the Lord to use us as an instrument. Light also represents Christ, and if we turn to the light, we can avoid deception and will be more likely to stand in holy places, having the Spirit with us. - Thursday (Share the picture of Jesus Christ in Gethsemane and the Band-Aid)- Jesus Christ showed us the importance of the Sacrament by teaching His disciples about the Sacrament. He teaches us how to love and serve unto the end. He endured many hard things but never lost focus on Heavenly Father and His divine mission. He also suffered in the garden of Gethsemane for ALL sins. Because of this selfless act, our wounds can be healed, sins forgiven, and hearts mended. - Friday (Show the picture of Jesus Christ being crucified and the paper that says, Applying Principles)- On this sacred day, Jesus Christ was tried, crucified, and buried. Jesus Christ could have corrected all who wronged Him. He could have walked away, yet He did not. Even in His most bitter hour He showed perfect love, compassion, and forgiveness. We should strive to show all people this perfect Christ-like love every day. Never forget that He understands every heartache and trial and that, with Him, you too can overcome all things. How can you overcome trials in your life or find ways to improve? 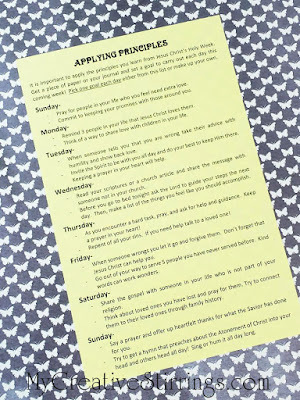 Read the Applying Principle Paper, get your journal, and make a goal each day of the coming week! 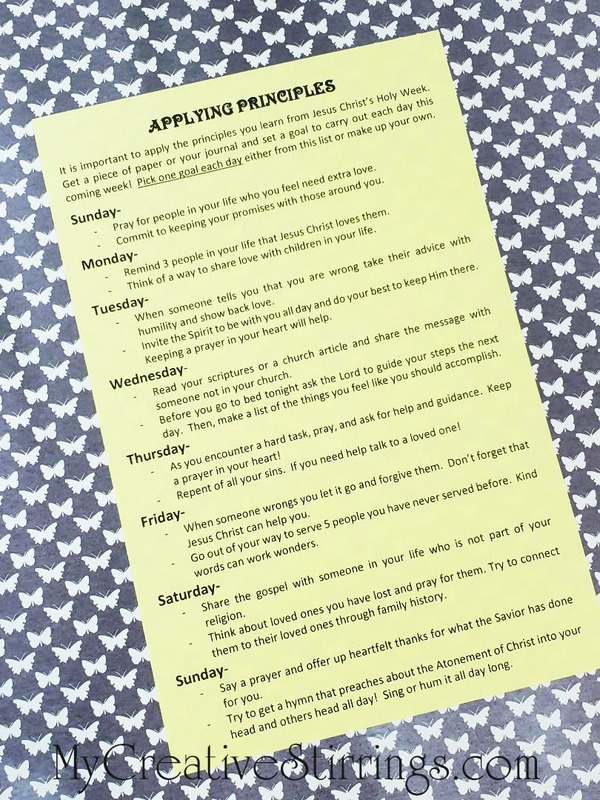 These acts of devotion will help you become more Christ-like. - Saturday (Pass around the Cloth)- After incredible suffering Jesus continues to show all His perfect love. 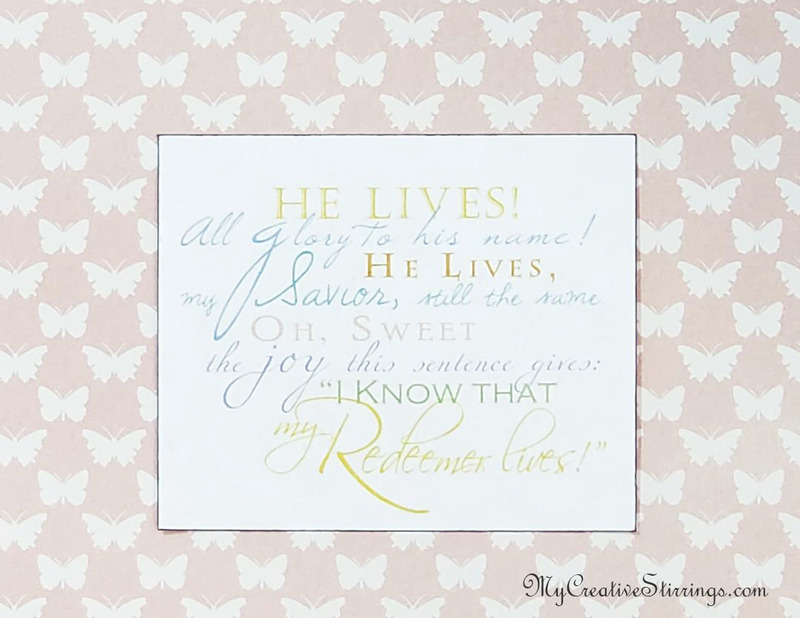 As His body rested in the tomb and before His resurrection His spirit shared the gospel with those who had already passed on. Doctrine and Covenants 138:30 says, “But behold, from among the righteous, he organized his forces and appointed messengers, clothed with power and authority, and commissioned them to go forth and carry the light of the gospel to them that were in darkness, even to all the spirits of men; and thus was the gospel preached to the dead.” Remember that the gospel of Jesus Christ is for all people and we should share with all. 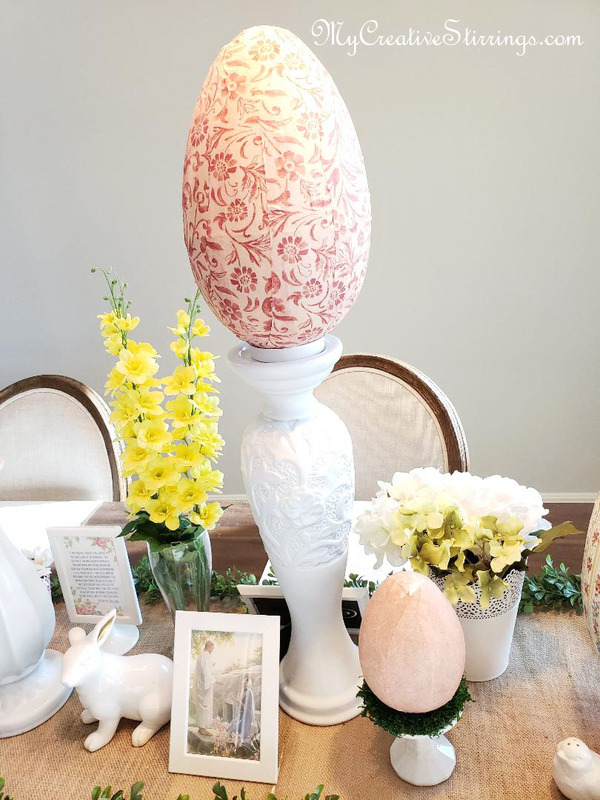 It is important to apply the principles you learn from Jesus Christ’s Holy Week. 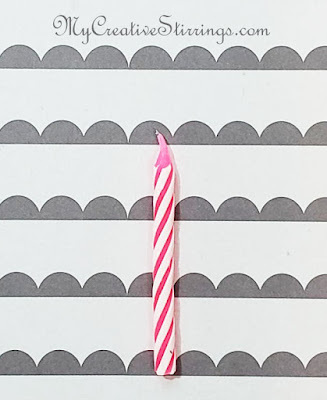 Get a piece of paper or your journal and set a goal to carry out each day this coming week! Pick one goal each day either from this list or make up your own. - Pray for people in your life who you feel need extra love. - Commit to keeping your promises with those around you. 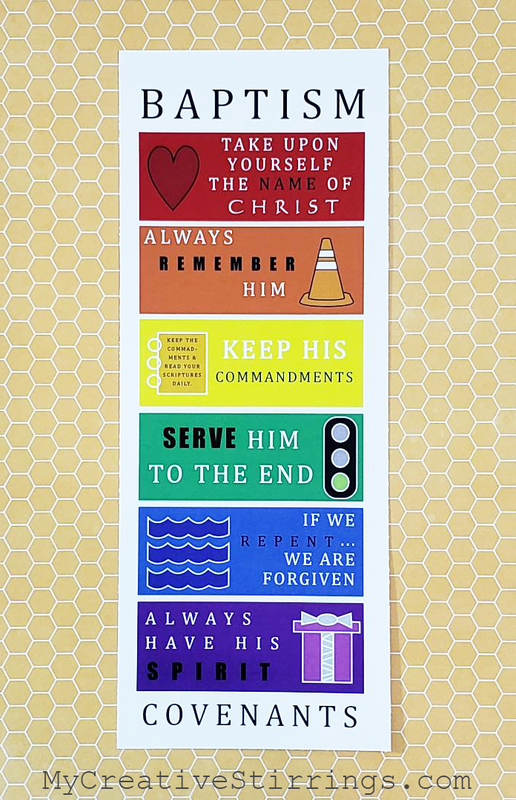 - Remind 3 people in your life that Jesus Christ loves them. - Think of a way to share love with children in your life. - When someone tells you that you are wrong take their advice with humility and show back love. - Invite the Spirit to be with you all day and do your best to keep Him there. Keeping a prayer in your heart will help. - Read your scriptures or a church article and share the message with someone not in your church. - Before you go to bed tonight ask the Lord to guide your steps the next day. Then, make a list of the things you feel like you should accomplish. - As you encounter a hard task, pray, and ask for help and guidance. Keep a prayer in your heart! - Repent of all your sins. If you need help talk to a loved one! - When someone wrongs you let it go and forgive them. Don’t forget that Jesus Christ can help you. - Go out of your way to serve 5 people you have never served before. Kind words can work wonders. - Share the gospel with someone in your life who is not part of your religion. - Think about loved ones you have lost and pray for them. 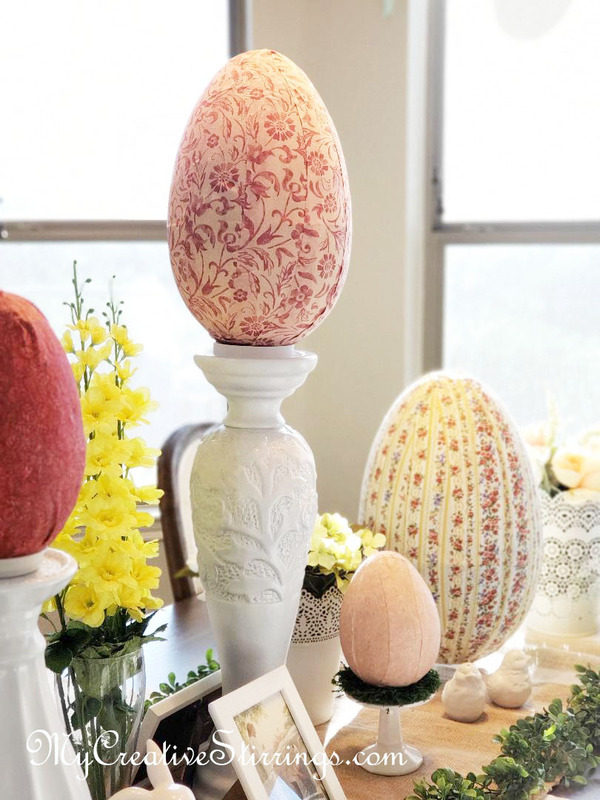 Try to connect them to their loved ones through family history. 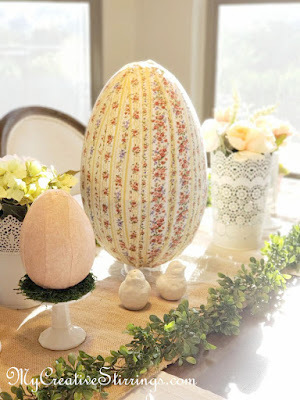 - Say a prayer and offer up heartfelt thanks for what the Savior has done for you. - Try to get a hymn that preaches about the Atonement of Christ into your head and others head all day! Sing or hum it all day long. 1. Three pictures of the Savior in Gethsemane, on the cross, and after His resurrection- Gospel Art Book (nos. 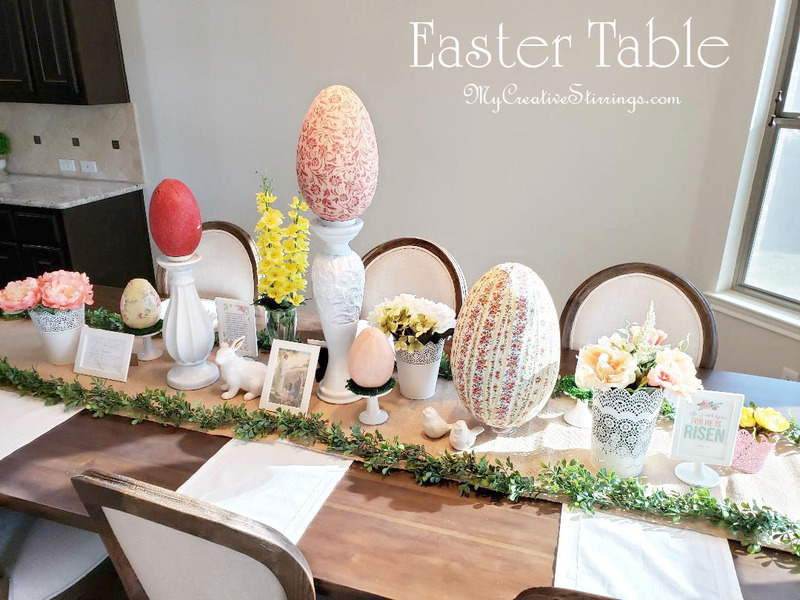 56, 57, 58, 59, and 60), Matthew 27:29–38, 59–60; John 20:10–18. 3. 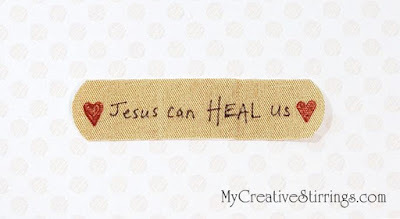 Band-Aid- Reminds us that Jesus Christ has power to heal all our wounds. 4. 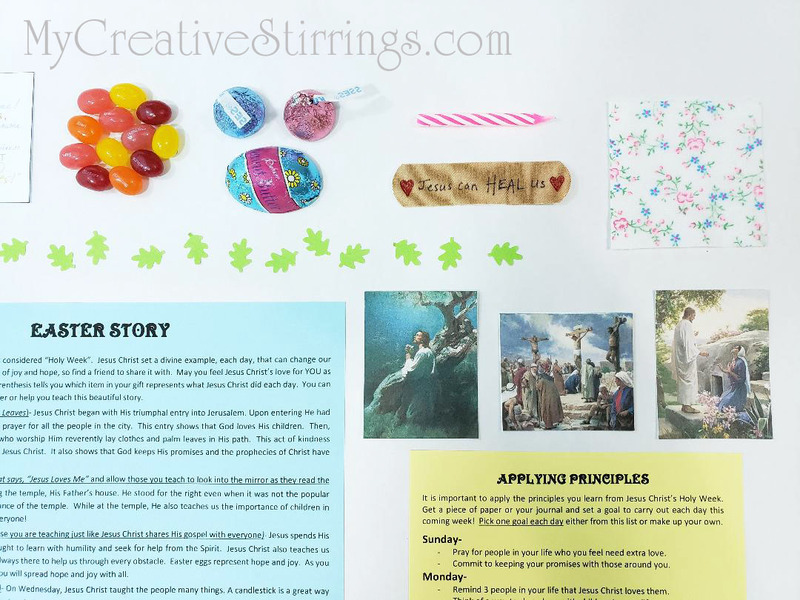 Candy- Share what you know about Jesus Christ with others. Candy Easter eggs represent hope and joy. 5. 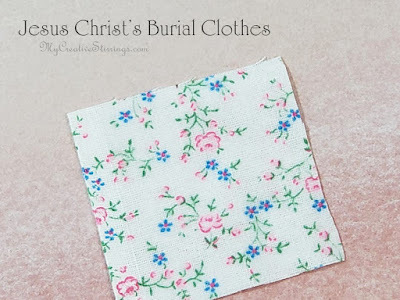 Cloth- Since Jesus was resurrected, I will be too. 6. Applying Principles- Help the receivers apply what they read. 7. Palm leaves- Symbolized the people's desire to follow the Savior. 8. Candlestick- “If ye are prepared ye shall not fear”, share your talents, and serve others…let your light shine. Look to the “Light” (Jesus Christ) and live. Here is a fun St. Patrick's Day gift you can make for a loved one. It is filled with lucky things and thoughts as well as encouragement to be a "Good Luck Giver". 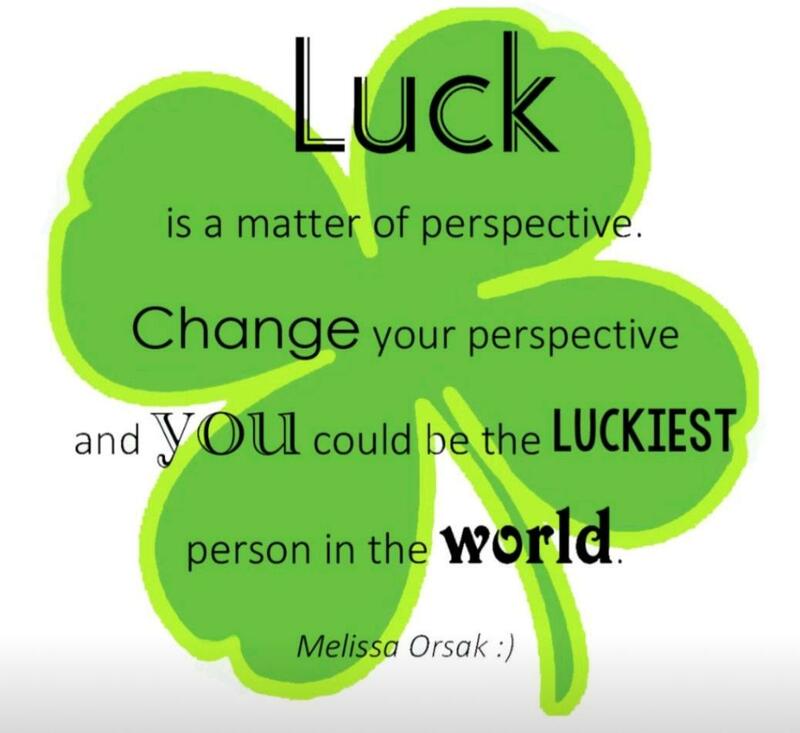 This St. Patrick's Day be a Good Luck Giver and help those around you feel lucky through service and love. Are you wondering what's inside this lucky package? This package contained an explanation paper (not photographed) as well as all you see pictured below. I would be happy to email you the explanation paper file if you would like it pre-typed. - Lucky Numbers- the day you were born was the luckiest day in your life. 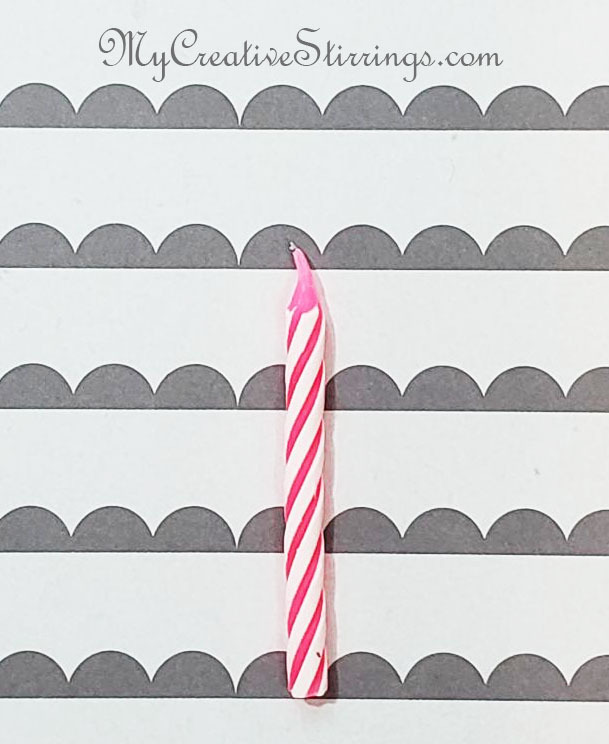 Your lucky numbers are your birth month, day, and year. - Penny- "Find a penny pick it up all day long have good luck. " This is your good luck token for the day. Carry it with you. Then, on the following day place it on the ground where someone else will pick it up. Spread good luck wherever you go and you too will be luckier :). -Friendship Bracelet- bring good fortune to another. Either give this bracelet as is or make it for a friend. If you really cannot part with it then every time someone notices your bracelet give them a compliment. - Leprechaun Hair (licorice)- bring good fortune to someone else. Give this lucky lock of hair to another person and tell them why you like them. If you really cannot part with it then share it with a friend. Every time someone peels off a strand, they should give the other person a compliment. All the items are stuffed into a toilet paper tube. 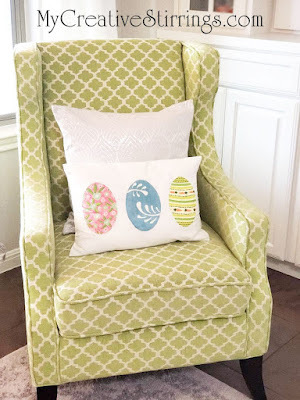 After you have stuffed your tube wrap it in green tissue paper and tie the ends with ribbon or string. Then, decorate with stickers or other fun embellishments. 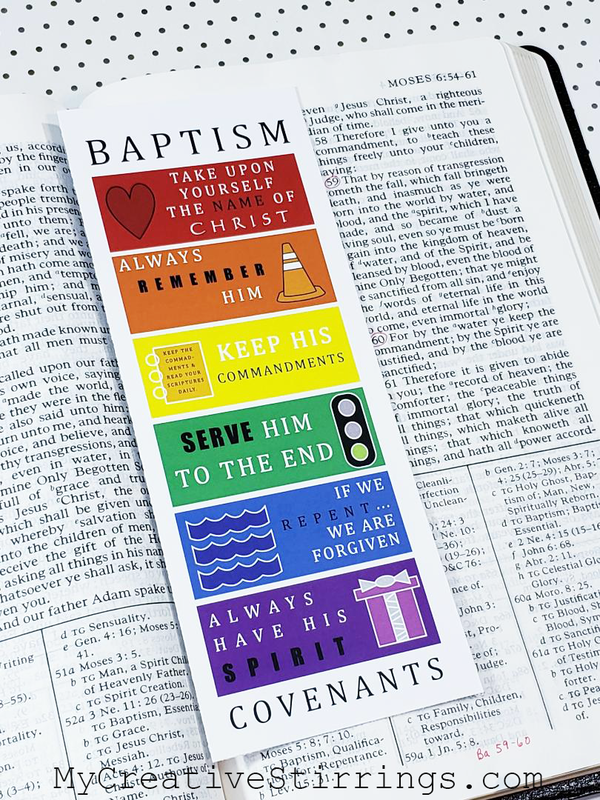 I finally created a bookmark that helps children remember the Baptism covenants they make and the promises they receive! 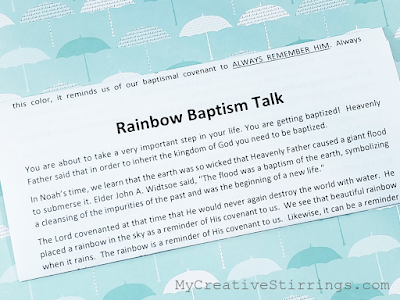 This bookmark coordinates with my Baptism Rainbow Talk and is now available super cheap in MyCreativeStirrings Etsy Shop. 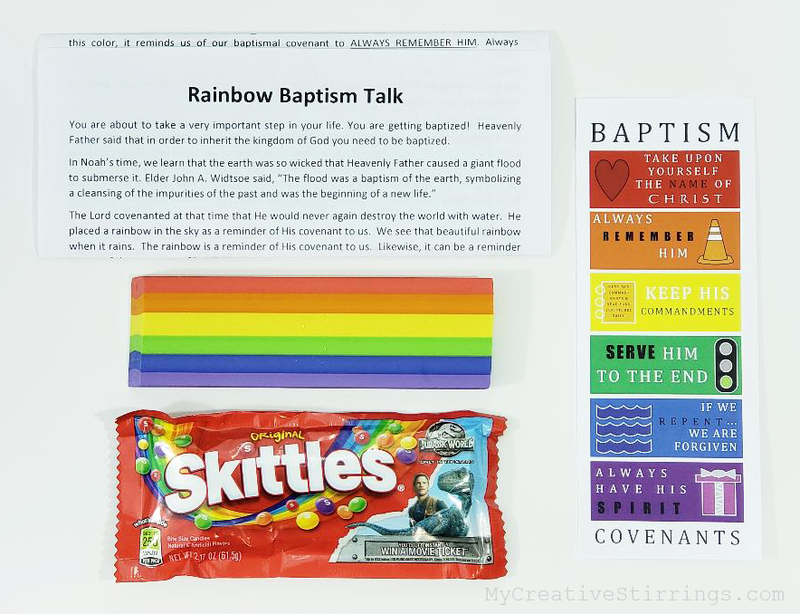 I have started giving a copy of the talk (also emailable in pdf form :)), the bookmark, and Skittles to each child in our ward who gets baptized. It is my simple way of serving the children around me. 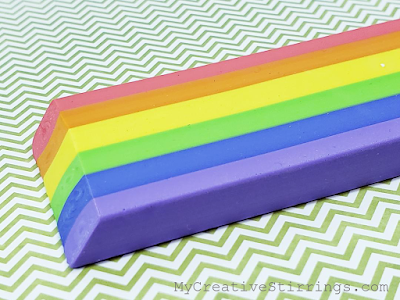 When I can find these awesome rainbow erasers ar the Dollar Tree I include those too. 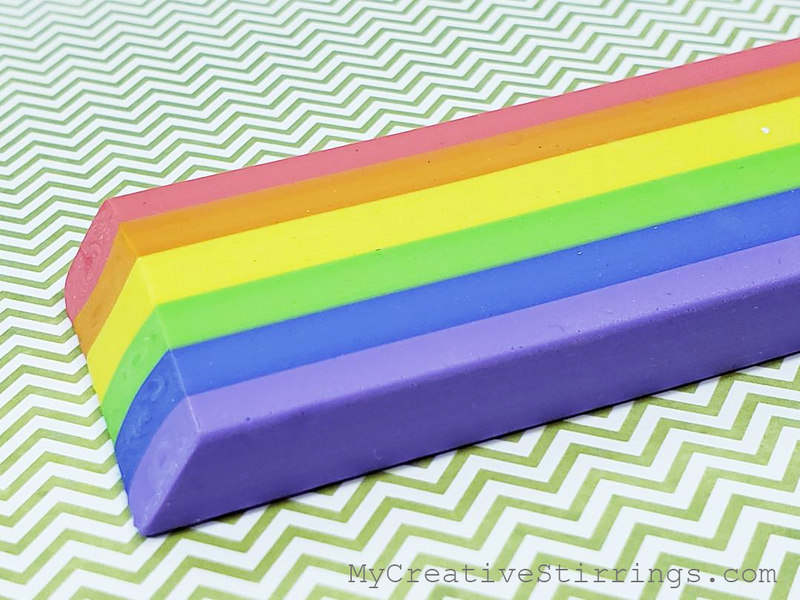 The coolest eraser ever! These seem to come and go at our Dollar Tree. Keep your eye peeled and when you find them purchase the whole case haha. This is what the PDF file looks like. There are three bookmarks per page. 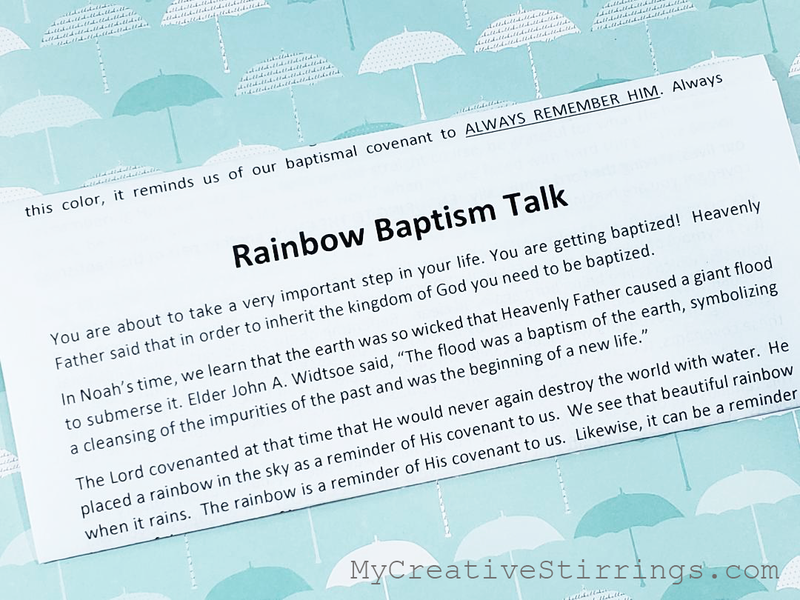 Check out my Original Baptism Rainbow Talk. Check out other items you can include in your Baptism Rainbow Gift bag.